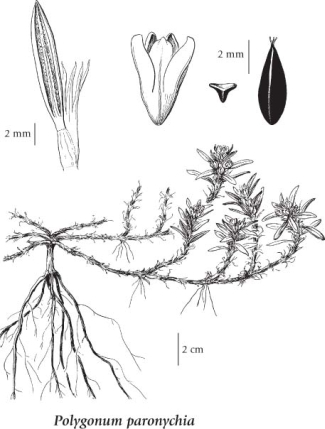 Perennial semi-shrub from a strong, fibrous root; stems prostrate to ascending, several, freely branched, smooth, rooting at the branch nodes, 30-100 cm tall/long. Basal leaves lacking; stem leaves alternate, narrowly oblong but rolled under and so appearing linear in outline, the blades 1-2 cm long, unstalked; stipules translucent, ragged. Inflorescence of several flowers in clusters in the upper leaf axils; perianths white to pink, 5-6 mm long, unequally 5-lobed 1/2 to 3/4 the distance to the base. Achenes, 3-angled, 4-5 mm long, black, smooth, shiny. Moist to mesic sand dunes and beaches in the lowland zone; infrequent on S Vancouver Island and the Gulf Islands; S to CA.